My friend Cathy Demers, hosts the weekly 20-minute business education series “The Business Success Cafe” – the Perfect Coffee Break. I was a featured expert at the “Cafe” awhile back. THIS WEEK Only – Cathy has brewed up something truly remarkable over at the “Cafe”…something you won't want to miss! 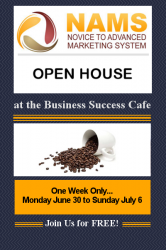 From June 30 to July 6 ONLY…the Business Success Cafe is providing free 20 minute video replays…highlighting NAMS instructors (I'm honored to be one of them!). NAMS is Novice to Advanced Marketing Systems and the NAMS workshop in Atlanta is coming up soon. To introduce you to NAMS, and to a sampling of the great education you can expect when you attend…. Instant access to the free video replay of my 20-minute Business Success Cafe education: “Protect Your Business Assets with Strong Password Management…PLUS! Which Plugins Will Really Help You Secure Your WordPress Site”- I know you'll love it! Information about the upcoming NAMS workshop (I'll be teaching in-person at that workshop) AND how to save $$$ on the price of a ticket AND how to get a 2nd ticket to give to whoever you like…for FREE! Instant access to the video replays of several other NAMS instructors (including Connie Ragen Green, Bob Jenkins, David Perdew, Kathleen Gage, Janis Petit, and Kristen Eckstein)! These are the same folks you are going to be able to meet and learn from at the upcoming NAMS conference. Each video replay is only 20 minutes and you are going to learn extremely important information on today's hot business topics, insider secrets from global experts, and priceless tips that will directly impact your bottom line. “See” you at the NAMS Open House! you will also receive a free gift too! It's something every success-minded person should have. Nice!